New book, 95 pages, ESS046. In 1467 the Onin War ushered in a period of unrivalled conflict and rivalry in Japan that came to be called the Age of Warring States or Sengoku Jidai. 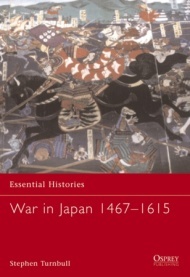 In this book Stephen Turnbull offers a masterly exposition of the Sengoku Jidai, detailing the factors that led to Japan's disintegration into warring states after more than a century of peace; the years of fighting that followed; and the period of gradual fusion when the daimyo (great names) strove to reunite Japan under a new Shogun. Peace returned to Japan with the end of the Osaka War in 1615, but only at the end of the most violent, turbulent and cruel period in Japanese history. This item was added to our catalog on Friday 31 January, 2014.